We got ice and snow on Friday, so this weekend was perfect for staying warm and sewing! I needed to make another Funky Friends pattern for the Island Batik 2018 Spring Market booth so I worked on that. For the 2017 Fall Market booth, I made two cuties but couldn't show you. Here's Diggles the Dragon. He's made with fabrics from the Morning Sunshine collection. This is such a fun, bright collection that it was great to work with. Isn't he adorable? My daughter fell in love so I may have to make her one for her college room. 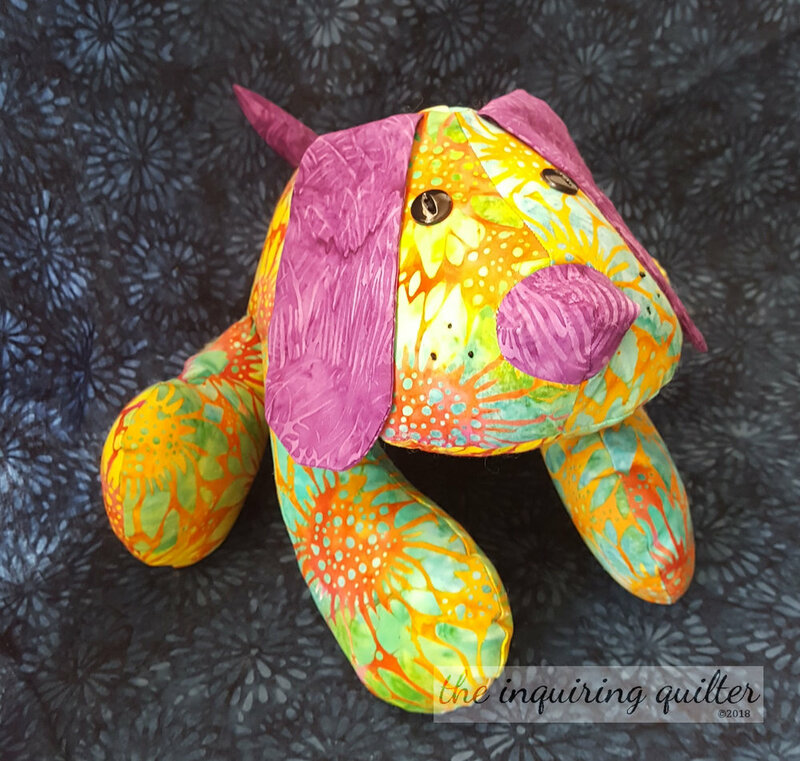 You'll find the Funky Friends pattern for Diggles here. I also made Puppy Dog Pete for the 2017 Fall Market booth. He's also made with fabrics from the Morning Sunshine collection. Just recently, they've added some Funky Friends patterns to the quilt store where I work (Always in Stitches). Not surprisingly <grin> I volunteered to make a sample for the store--Hannah the Hedgehog. I'll share photos of her once she's made. Right now, I can tell you she's simply adorable. I don't know why I like making these, but I sure do! I didn't make it to Fall Market, but here's how Island Batik decorates their booth with the Funky Friends. These photos are from Spring Market 2017 so the Funky Friends I made are not in the photos. The Diggles and Pete I made appeared at Fall Market. Aren't the booths gorgeous? Makes me glad I'm not a shop owner. I mean, how could you choose just which collection(s) to carry in your store? For 2018 Spring Market, I'm making Fleur the Flamingo. Oh man is she cute! Here's the photo from the pattern so you can see what I mean. I can't show you much of the Fleur I made until after Market, but here's a sneak peek. Most of the fabrics I used for Fleur are from Island Batik's Basics and Blenders collections, such as the red I used for the legs. The body and wing fabrics I used will debut at Market. You'll find the pattern for Fleur here. I'll be sure to show you Fleur after Market. Really, she's so cute! Speaking of Island Batik, the month-long Island Batik Four Seasons Blog Hop is still going on, and it's one you don't want to miss! Click here to see what I made with the new Blue Moon collection. Be sure to leave a comment and an email address to enter my giveaway to win a charm pack of Blue Moon. Also, at the end of the post, you'll find a list of the Island Batik Ambassadors participating in the hop. Visit each one to enter their giveaways and to see the batik collection they're featuring. And don't forget to use the Rafflecopter at the bottom of the post to enter the Island Batik giveaway! They are giving away four precut collections so you'll want to enter for a chance to win! Well, that's what I've been up to. Let's see what you've been doing. First though let's see who made the weekly feature. This week I want to feature several people. There were so many creative entries last week that I can't help myself! First up are my fellow Island Batik Ambassadors and the quilts they made for the Four Seasons Blog Hop. So gorgeous! Connie @ Free Motion at the River created Alpine Snowflakes and Laura @ Slice of Pi Quilts created Snowfall. Both girls used the Alpine Ice collection. Isn't it fun how different the two quilts are? Be sure to visit their blogs and the blogs of the other Ambassadors to enter the giveaways! I'd also like to feature Jan @ Cocoa Quilts and Dione @ Clever Chameleon Quilting. Both ladies shared their Regatta quilts with us. Fast and easy using a Jelly Roll, these quilts seem to me like the perfect palette cleanser after a year of creatively complex quilts. 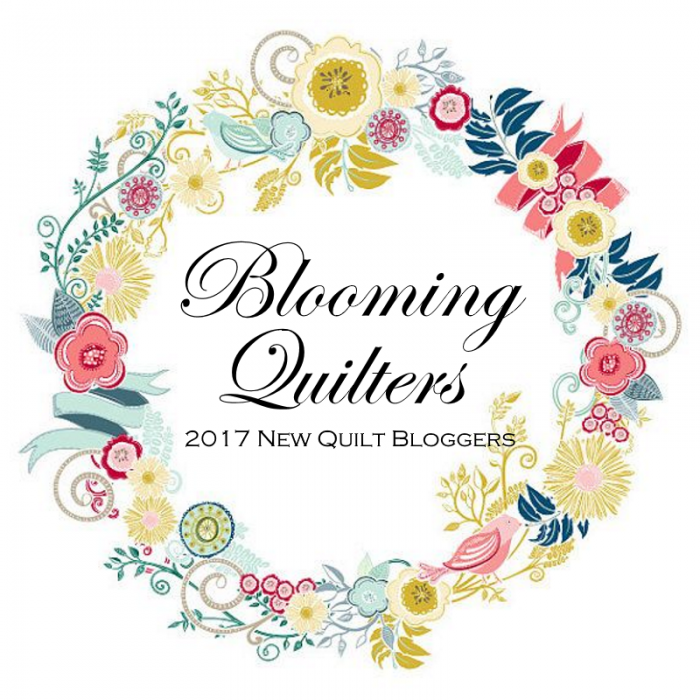 If you're looking for a simple quilt you can bang out easily, visit their blogs for more info! Don't you love how lovely these quilts look? Congratulations ladies! Here's an "I Was Featured" button for your blogs.